Fly-by-night cabinet contractors often cannot guarantee their work, especially when they are unsure if they will be in business next month or next year. Houston Cabinets is proud to have been serving clientele in Houston and surrounding areas for more than two decades. 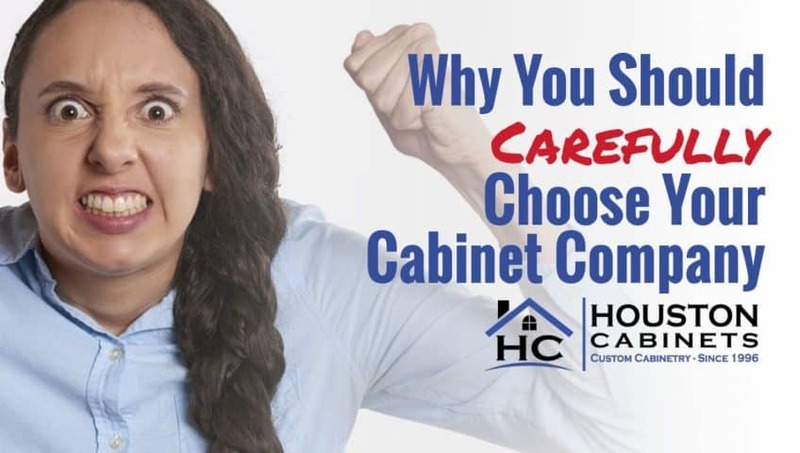 The longevity and sustainability of Houston Cabinets speaks for the superior quality, service, craftsmanship and satisfaction guarantee that comes with each and every installation. Kitchen and bathroom cabinets can make or break a room. Not only do they need to look nice, but they must be both durable and functional as well. While many cabinet contractors use a cookie cutter approach, Houston Cabinets crafts custom kitchen cabinets and custom bathroom cabinets to meet the exclusive needs of our clients. We pride ourselves on not being a “typical” cabinet company, taking whatever time is needed to determine the best solution for your budget. Unlike inferior cabinet contractors, Houston Cabinets only partners with companies whose quality we can trust and manufactures their products in the U.S.A. We ensure only the best raw materials are incorporated into the construction of your kitchen and bathroom cabinets! Whether you are planning a renovation or building a new home this upcoming year, give Houston Cabinets a call today.